Friday the Bureau of Labor Statistics and the NC Division of Employment Security released data on the state of North Carolina’s labor market. The unemployment rate ticked up to 6.4 percent over the month but is still below where it was a year ago. Despite this annual improvement in the unemployment rate, the reality is the labor market continues to provide too few job opportunities for those who seek work. The number of missing workers, which estimates who would be in the labor market if job opportunities were stronger, provides additional insight into the state of North Carolina’s labor market. 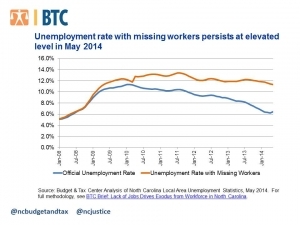 As of May 2014, there are an estimated 230,517 missing workers in North Carolina. Again, these are North Carolinians who would be seeking work if jobs were available. If these workers were included in the official unemployment rate that rate would be nearly twice the official unemployment rate: 11.3 percent rather than 6.4 percent. What? Team Civitas hasn’t been 1st to post on this topic? I looked here and fully expected some derogatory comment about Mexicans from the “patriots” and “real Americuns”. As usual, Alan tries to be funny and misses the whole point of the article. Actually, there are millions of missing workers in the US who can’t find work in this lousy economy. Our worker participation rate is the lowest in the last 40 years, and he simply ignores the fact. Yes Alex, I missed the point entirely, didn’t I? And who do we have to blame for the “lousy economy” Who was it that deregulated and ultimately crashed the US economy, and with it almost the entire global economy? Here’s a clue for you, it wasn’t Obama. Glad to see you stepped in to answer on behalf of Team Civitas. This post makes no sense as NC is doing great in the job market when you consider the headwinds that the Democrat party in DC is putting on us. John Hood makes some good points in a current article. North Carolina’s employment-population ratio — which takes into consideration both people dropping out of the labor force and the need for job creation to keep up with population growth — rose from 56.8 percent in June 2013 to 57.4 percent in May 2014. During the same period, the nation’s employment-population ratio rose by only two-tenths of a percentage point.